Hi Angel! Happy Solstice!! I've been hunkering down and not posting much this week. I know you're busy too, getting ready for your Winter Solstice and Christmas celebrations and starting to pack up the house for the big remodel. How exciting! 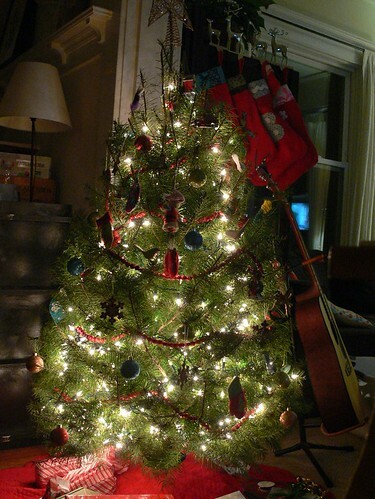 As I type this, everyone is asleep in the house, aside from our little Christmas tree still bright and shiny in the dark night. I've been a crazed little elf every night for the past week or two. Since we're both so busy and in need to focus on our families during this lovely holiday season, let's take a little blog vacation. We'll be back the first week of January with regular posts! 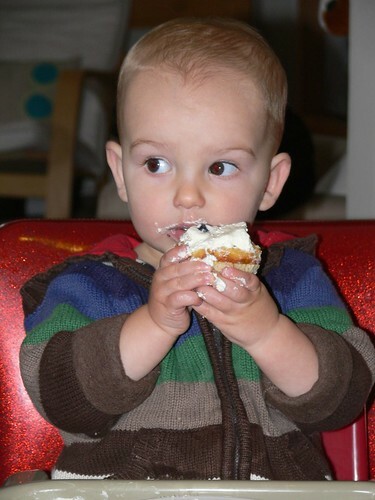 But before I go, I wanted to recap some of my personal favorite moments and projects on the blog in 2011. It was an exciting year, full of fun events and so much growth, both as a blog and as individual crafters. 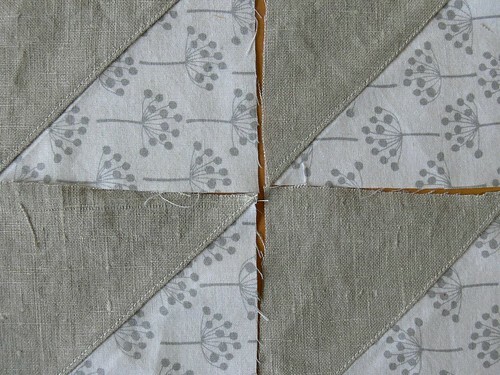 If you're new to Stumbles & Stitches, this should be a fun little intro to what we're up to around here. Happy Friday! Yesterday was the last day of preschool for Ben before the holidays. I had volunteered to present a "holiday tradition" to the class, so I talked about Winter Solstice and made pine cone bird feeders with the kids. Yesterday was also the day we brought teacher gifts to school. I had great plans to hand make a special gift for each of Ben's awesome teachers, but a couple of days ago, I realized this was just not going to happen. 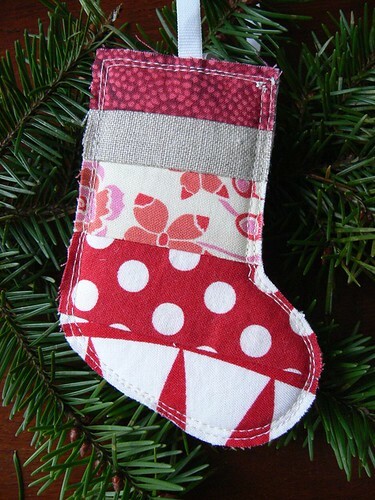 Instead, I whipped up a little Scrappy Stocking Ornament for each of them, except bigger so it could fit a gift card. Obviously it is open at the top, and also lined. Hi Angel! I hope you're well and keeping your head above water as we enter the final stretch toward Christmas. I am officially Overwhelmed, with a capital O. I have been so busy making gifts as well as items for my Etsy shop and custom orders, along with the regular routine of raising 2 small children and running a household, plus all the typical holiday craziness. You know how it goes. But can I just say: AAAHH!!!!!! I was contacted by a lovely lady named Christina back in early November to create 4 holiday pieces for her family members. They exchange unique holiday gifts at Thanksgiving and she wanted to wow them. 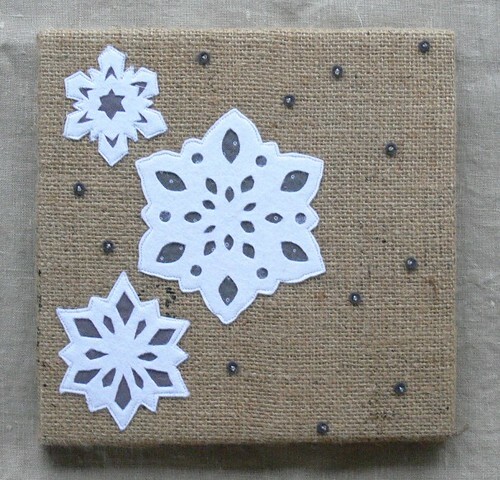 After some back and forth with sketches and ideas, we settled on 4 burlap art pieces: 2 with stockings and 2 with snowflakes. Along with the grey snowflakes above, here are the other 3 pieces I made for her. 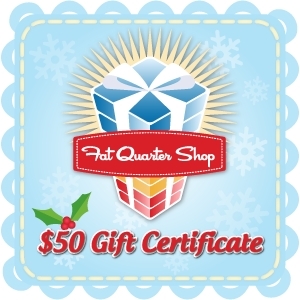 It's giveaway day on Sew Mama Sew and we are participating with a very generous giveaway by our sponsor Fat Quarter Shop: a $50 gift certificate! That's right! 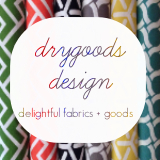 That is $50 to spend on beautiful fabrics, patterns and more. How to enter: For a chance to win this fabulous prize, simply write us a comment. 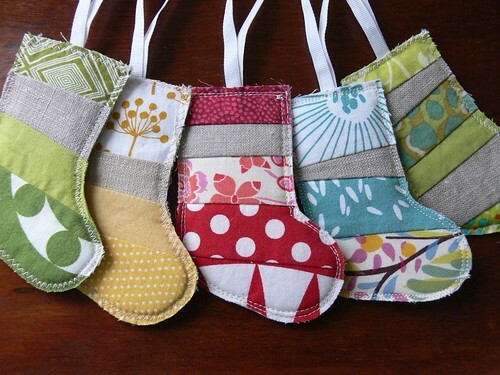 If you'd like, tell us about the best handmade gift you've ever received or your favorite handmade item to have ever given. One entry per person, please. This giveaway is now closed. Thank you to everyone who participated! The lucky winner is Maya of redzshadow. Congratulations, Maya! We've sent you an email. 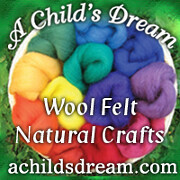 If you're new to Stumbles & Stitches, a very warm welcome! We are so glad you're here! We hope you'll stick around, browse a little and subscribe. 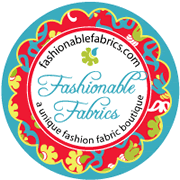 You can also find us on Facebook and Twitter. And let's not forget Flickr and Pinterest. 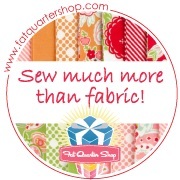 A huge thank you to Fat Quarter Shop for this awesome giveaway, and to Sew Mama Sew for organizing giveaway day! 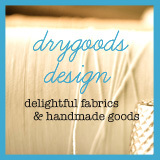 Make sure and go check out all the lovely people giving away supplies and handmade goodness all over the blogosphere. Pssst... For giveaway day, I'm also having my first giveaway of a Jenny Bartoy original! 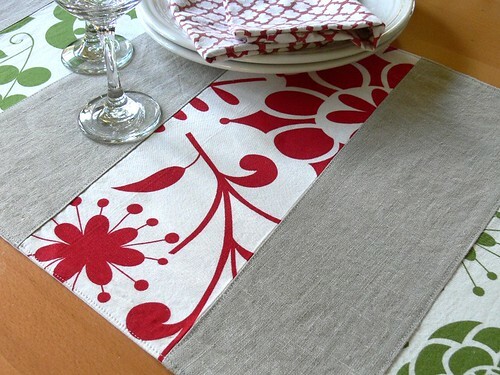 Go check out the details and enter the giveaway here for a chance to win one of my Wonky Stripe Christmas Table Runner, or a custom Wonky Stripe Table Runner -- your choice! How is it Thursday already? AAH! Slow down the countdown to Christmas puh-lease! Anyone else freaking out that it's less than 3 weeks until the big day? I did complete a Christmas gift yesterday, but more on that in a second. A couple of months ago, our friends at Lark Crafts sent us the book 100 Pretty Little Projects to check out. I am excited to share my review with you guys today and show you the fun project I made from it. If you'd like a copy of 100 Pretty Little Projects for yourself, make sure and enter the giveaway at the end of this post for a chance to win one! 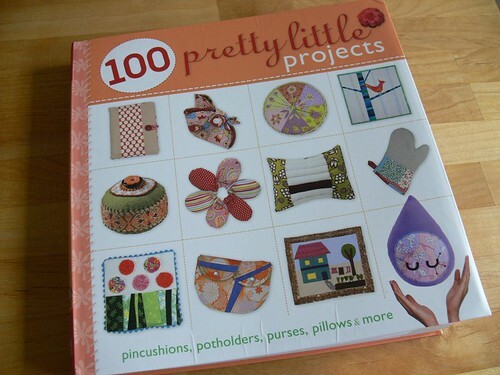 100 Pretty Little Projects is a compilation of favorite projects from the popular Pretty Little series. It features cute and practical projects from fabulous designers and crafty bloggers including adorable pincushions, coasters, patchwork potholders, doll quilts, pretty pillows, trendy clutches and much, much more. The book is organized in four loose categories: Enjoy, Use, Hold and Give. Hello Angel! 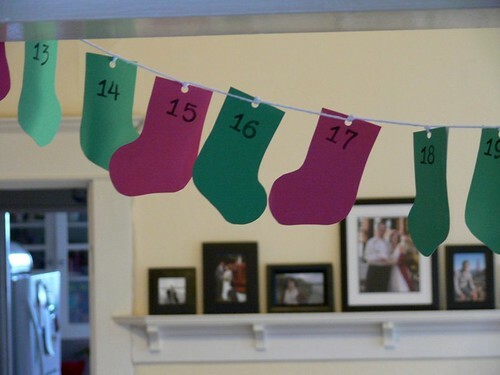 I loved your little Christmas wrap-up yesterday and wanted to share the ONE Christmas decoration we have put up so far: a stocking Advent garland made by Ben (with a little help from me). I was so determined to make a beautiful Advent calendar this year but have been so busy and overwhelmed, it didn't happen. Ben has been asking about a calendar for weeks, begging me to purchase the cheap chocolate kind at the grocery store, so I decided it was time to make one, even if it is temporary! Last week, Ben noticed the template for my Scrappy Stocking Ornament lying around my desk and asked me if he could color it. That's when a little light went off in my head. I created a coloring page for him on card stock by tracing 6 stockings. 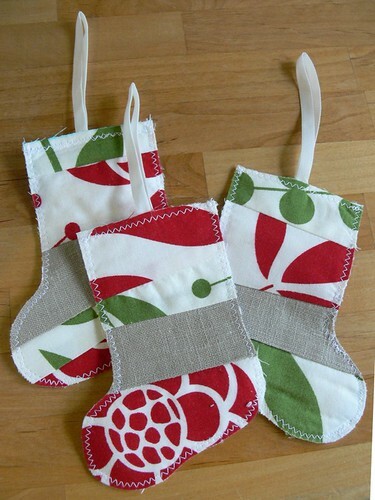 4 pages of stockings make 24, perfect for Advent! While I was sewing, Ben sat at the table next to me with his markers. 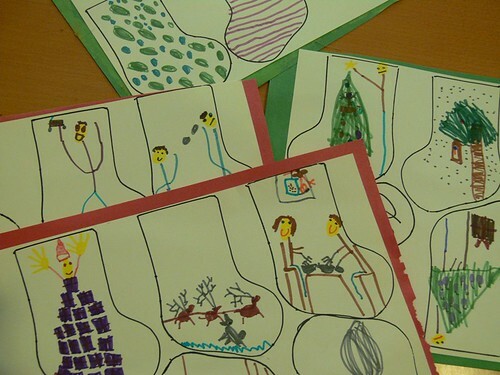 We talked about all the special things we do during December and he drew them. Our family celebrates Winter Solstice, so several of the pictures focus on that -- making bird feeders, lighting the candle, eating mushrooms for dinner (husband's traditional Solstice recipe!). We also celebrate Christmas and many of Ben's drawings depict the magic of that holiday for him: decorating the tree, Santa and his reindeer, opening gifts with his little brother. 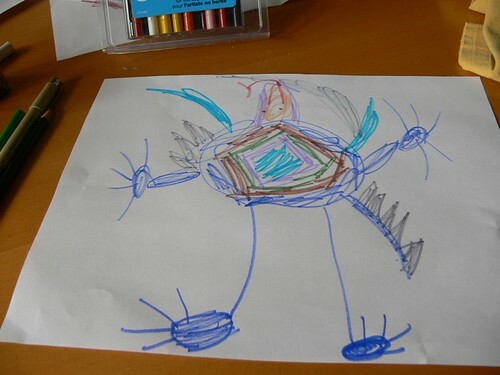 We also talked about winter and what's special about it so he drew a lot of snow- and ice-related things. Friday was a gross rainy day for us. I was busy cleaning the house and doing laundry, getting ready for friends visiting over the weekend. Ben was getting antsy and asking me for an "activity". Inspired by a little jack o lantern foam craft sent by my mom, I pulled out our craft felt, some scissors and some white glue and let him have some fun. 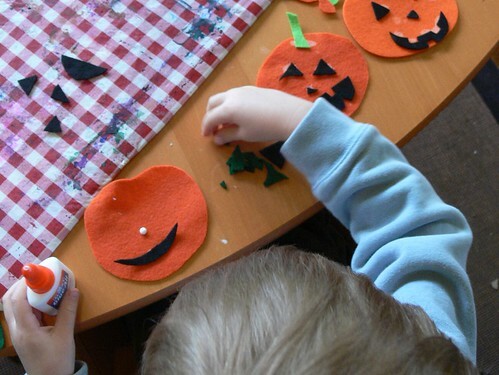 He cut out a bunch of shapes and glued them into ghosts and small pumpkins. I then cut out various pumpkin shapes and a bunch of mouths and triangles, and let him assemble some jack o lanterns. Happy Tuesday! I hope this week is going well for you so far. I am running on way too little sleep between a baby who's working on his two front teeth and shipping my first few orders for the Etsy shop. Man, this Etsy business is not for wimps. I guess the good thing is I've made some sales, yay! But the amount of work required to make it all happen is a bit overwhelming. It's all good and exciting though, and I'm sure I'll get into a groove soon enough. Moving on... Sew Mama Sew shared a Salon article on their Facebook page yesterday, called “Put a Bird on It”: The aftermath. 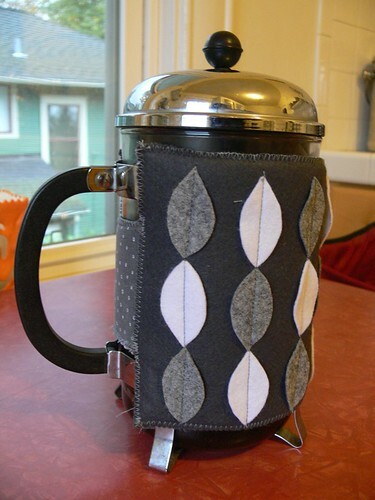 The article discusses how the Portlandia sketch "Put a Bird on It", which poked fun at the ubiquitous bird in today's design and craft products, affected crafters and hipsters -- or not. I love that skit, it's hilarious and silly and kind of right on. Disclaimer, I read the article quickly, but it made me think a lot. The essence of my reaction was: I don't care. I like birds and I'm going to keep putting them in my projects when I feel like it. If people like birds too, then they'll like my project. If not, well, that's okay. 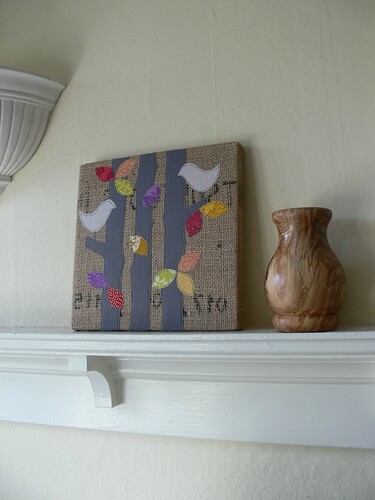 I'm so excited to be featured on Whip Up today with a guest post: a tutorial for making your own birdie burlap wall art! 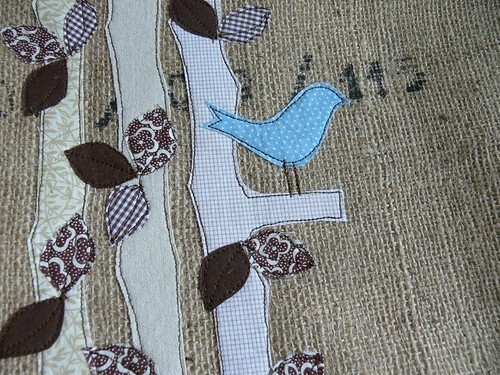 I know, I know, it's all about the burlap art for me lately with the launch of my Etsy shop. What can I say? I'm a little obsessed. But isn't it pretty? I love how this project turned out! 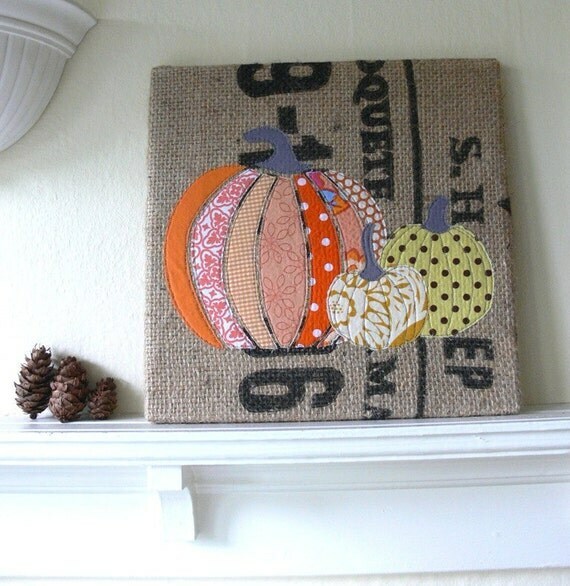 This burlap art is made from an upcycled coffee bag and a mix of colorful fabric scraps. It features two birdies having a conversation across the woods at sunset. It was inspired by my neighbors, who found each other and fell in love despite hailing from Alaska and Mexico respectively. They told me their story in our backyard in Seattle on a lovely day at sunset. I don't know about where you are, but here in Seattle, autumn has firmly landed. Rain is back, there's a chill in the air, leaves everywhere and the light has changed. As much as this weather doesn't thrill me (especially after a much too short summer), I love the wealth of activities this season brings with it (Leaf collecting! Acorn gathering! Pumpkin picking! Pie baking! Cider drinking!) and the anticipation of the nearby holidays. I am so happy about these pumpkin pieces!! 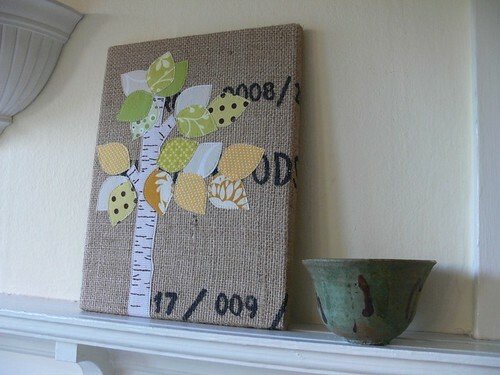 I think the style is really different depending on the background -- boldly stamped coffee bag or plain burlap. I love both for different reasons. (They are for sale in my shop now, click on the photos above to go to the listing). I thought I would share a little bit about my process for creating these, in case you want to make a similar project. 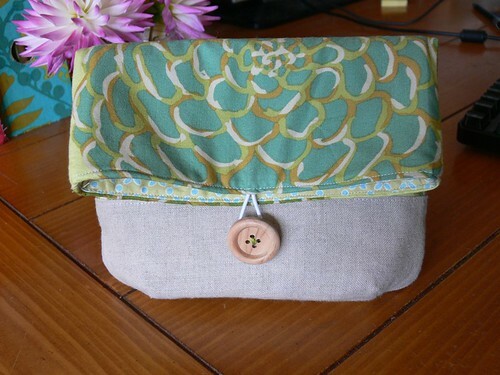 I'm also assembling a few kits for my shop with the template, instructions, burlap and fabric to make these. I'll update here when they're ready and listed (probably tomorrow at some point). 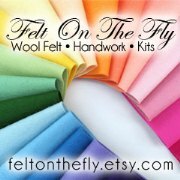 Kits are in the shop now! Here's one. 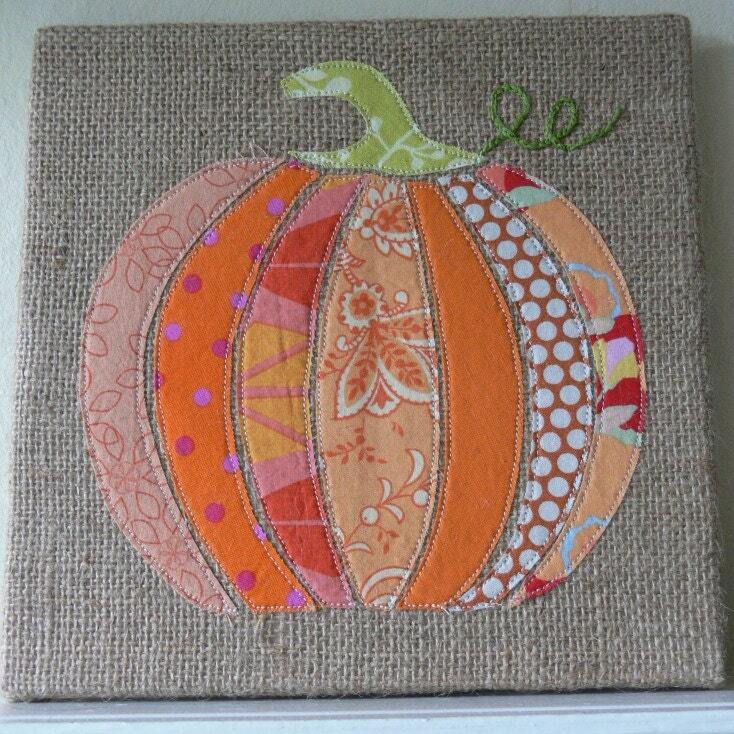 Update: I've also listed the PDF pattern for this pumpkin art in my shop here. Hello Angel and friends! Quick post to let you know I am open for business. 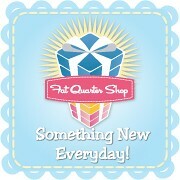 The shop is launched. Yeehaw! I hope you'll subscribe and "like" me on Facebook! I'm so nervous about this whole deal, but very excited too. Hello! Quick post in the midst of Etsy shop launch madness to update you on our progress on the Rainbow Lizard costume. The last time I wrote about this, we had a "dee-zign" by Ben, some sketches by me and a whole stack of eco-felt ready to roll. The first part we tackled was the largest: the back with all the scales. I used one of Ben's shirts to get a rough idea of the size and traced the outline on the blue felt. 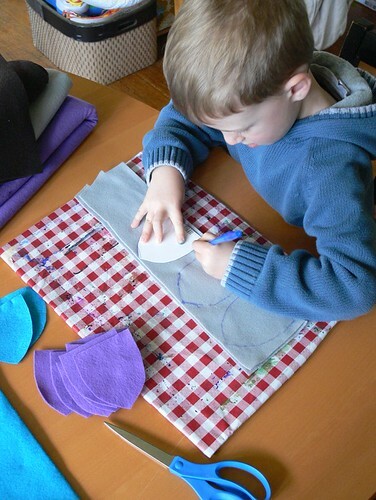 Ben helped me trace scales on all the different colors of eco-felt. 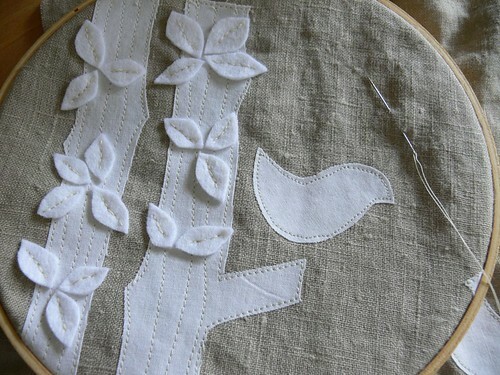 I cut them and sewed them on, in the order he chose, on the back felt. Halloween is fast approaching. Are you ready? We've been working on our Rainbow Lizard costume and, slowly but surely, it's starting to come together. Can't wait to show you the progress! I still need to figure out what Henry is going to be. I'm thinking caterpillar or spider, we'll see. 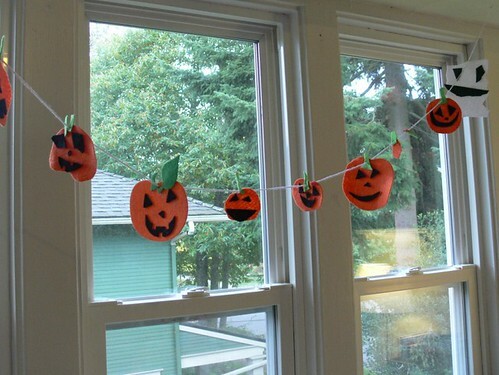 Aside from costumes, I want to have some fun with Halloween decorating this year. 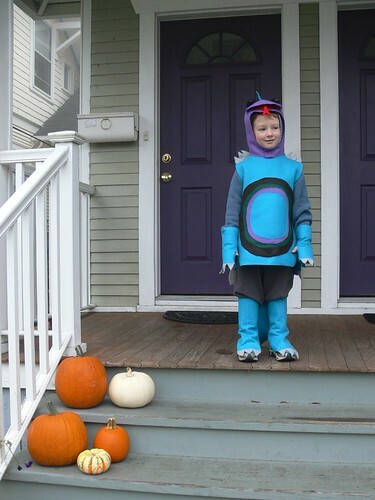 I have been pinning lots of fun stuff on my Halloween board on Pinterest. Here are some of my favorites. All right, moving on with the Halloween links! I'll let the pictures do the talkin'. Launching an Etsy shop is way more time consuming than I had ever imagined. I keep pushing off my opening date. I think I should finally be able to launch it by this weekend. I think. Don't quote me on this. I am so excited though, I wanted to show you what I've been working on! So here's a little sneak peek. Let me know what you think! !